The Taste of Scotland selection is a charming gift hamper celebrating Scotland's traditional food and drink and some of its newer taste sensations. Favourites include Tunnocks Tea Cakes, Walkers Shortbread, Isle of Arran Cheese, Baxters Soups and Irn Bru. Stahlys tinned haggis is a delight, and would you believe there are haggis flavoured crisps too? Old fashioned ginger cake, milk and dark chocolates made on a Borders farm and traditional Scottish tablet complete the selection – a great gift for a Scottish expat far away from home. 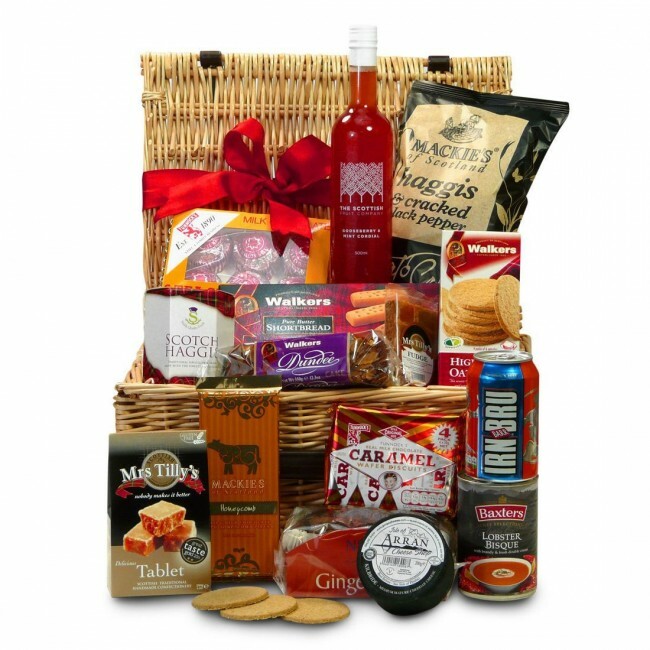 Scroll down for a complete list of the Scottish food and drink in this hamper. The Taste of Scotland Hamper is carefully packed by hand in an elegant wicker basket with hand-tied ribbons. Remember to tell us what you’d like written on the personalised gift card included inside.